Experience the dimensions of sound! With modest beginnings over 28 years ago as Media Artists, Qube Cinema Technologies has established itself firmly as a pioneer in providing audio solutions across the country. Qube has always been at the forefront of media technology in India. Be it the revolutions in picture with AVID, sound with DTS (now Datasat), Audio postproduction with Protools, to the complete reinvention of the way people see movies at the theatre with Qube Digital Cinema in 2D/3D, Qube has always insisted on bringing the best and the latest media technology to the discerning Indian cinema industry. Qube is partners with Dolby to bring in Dolby ATMOS, the path breaking 64 Channel Immersive Audio format. 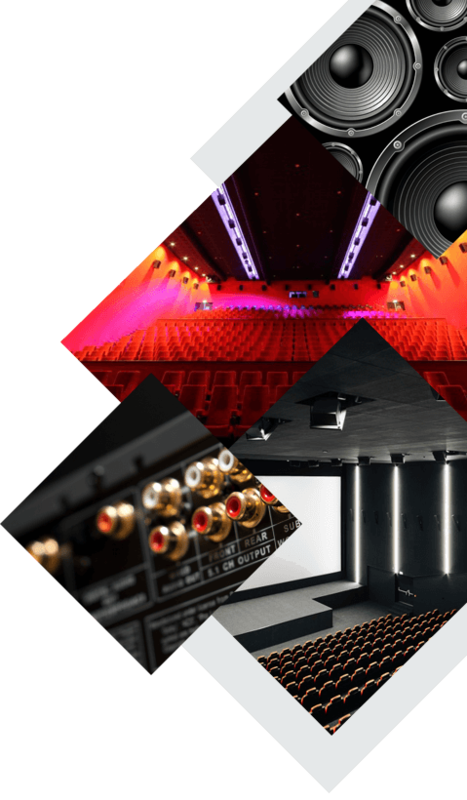 The Immersive Audio team advise in selecting the best equipment and accessories for projection of picture and sound and provide all required audio equipment and accessories for Dolby ATMOS, Dolby surround 16 and 7.1 surround sound. We offer integration, training, commissioning and calibration of the audio system and annual maintenance and support. Our understanding of the domain, our ability to innovate, our large customer base and our impressive infrastructure are all unmatched in this industry. We are involved in the design, commissioning and upkeep of almost every DTS film-mixing studio in India. Audio team has more than 100 years of cumulative industry experience. India’s first DTS sound mix by Qube Cinema team. India’s first Dolby SR sound mix by Qube Cinema team. India’s first Dolby ATMOS mix by Qube Cinema team.